Fifteen years after performing at the Sydney Olympics and 13 years after retiring from competition, Lisa Mason has returned to action in stunning form. Lisa, who now lives in MiltonKeynes, started to tread the return path with her first competition since the Olympics Down Under when she bravely jumped feet first into the British Championships 2014. Carrying niggles and injuries brought on by the new intensive work out, she struggled in this first outing. This would have been enough to stop most in any comeback, but not Lisa as she is not intimidated by taking on the best teenage sensations across the country. But training at the Heathrow Gymnastics Club in London and training for 20 hours a wee has left her fighting fit for competition once more. Three weeks ago, she entered the English Championships her first real big test and she won Bronze on Vault, Silver on floor and overall came fourth. Two week after this she went to Liverpool and entered the British Championships to take on the very best gymnasts in the country and she came seveth on beam, fourth on vault and her stunning floor routine was deemed the third best. She was placed overall seventh place, a stunning result, but was she happy, no she was not, she felt she could of done better, what an inspiration she is to older athletes. 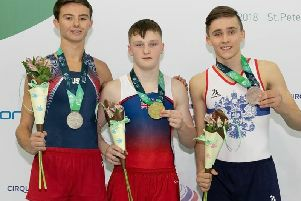 The bronze medal on floor means that Lisa is the first modern day gymnast to win British national medals in two different decades, but the real record is that there was a whole decade between the two. But the eyebrow-raising doesn’t end there, as Lisa has, on the back of her amazing resurrection, been invited to train with the national squad the first time in 16 years. “It’s all about hard work, dedication and not giving in,” she said.